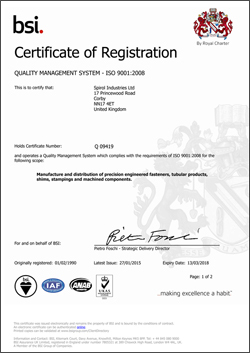 Corby, Northants, UK (January 29, 2015) — SPIROL Europe is pleased to announce that both SPIROL United Kingdom and SPIROL France have had their ISO 9001:2008 certifications reissued for three years by the British Standards Institution applicable to the manufacture and distribution of precision engineered fasteners, tubular products, shims, stampings and machined components. ISO 9001:2008 is based on a number of quality management principles including a strong customer focus, the motivation and implication of top management, the process approach and continual improvement. Using this standard helps ensure that customers receive consistent, good quality products and services. SPIROL Industries Ltd. is located in Corby, England and SPIROL SAS is located in Reims, France. SPIROL also has other divisions located in Brazil, Canada, China, Czech Republic, Germany, Korea, Mexico, Poland, Spain, and the United States providing a unique position in the global marketplace. Here is a link to download a copy of SPIROL Europe's ISO 9001:2008 certifications. View or download the quality certifications for all of SPIROL's global locations. SPIROL is a leading manufacturer of a diverse line of engineered components for fastening, joining and assembly, including Coiled Spring Pins, Slotted Spring Pins, Solid Pins, Disc Springs, Alignment Dowels and Bushings, Spacers, Compression Limiters, Machined Nuts, Threaded Inserts for Plastics, Precision Shims and Washers, Pin and Insert Installation Equipment, and Vibratory Parts Feeders.